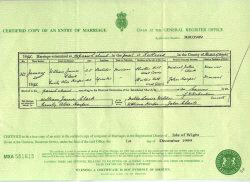 In July 1837 the registration of births, marriages and deaths began in England and Wales (later in Scotland). Again this is susceptible to errors and omissions like any other listing or index. However, it provides a far superior source of information than the parish records. In the case of births, the father's occupation is given along with the mother's maiden surname. 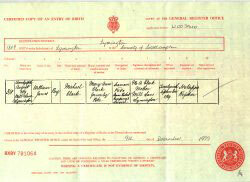 On marriage certificates the father's name and occupation are listed for both the bride and groom. Our research is also assisted by the inclusion of witnesses, who were often members of the bride and groom's families. On death certificates details of the informant of the death are given; who can often turn out to be a relative. Wills are also a valuable source of information, providing details of not only the land and property of the deceased but details of the beneficiaries. In theory (and it is theory!) 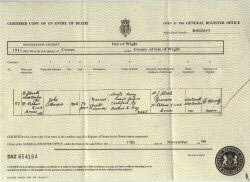 all births, marriages and deaths were recorded and certificates issued. Indeed, once we get beyond around 1875 the records become vastly more accurate and one can obtain a wealth of information. References for all three events are listed in the GRO Index. This can be searched, the correct reference obtained and copies of certificates purchased. Copyright© Sovereign Ancestry 1997. All rights reserved.